19 quart aluminum tank with baffles relocated to front trunk and hood B&B cooler with Canton Mecca filtration and hard lines. Full cage tied into the front and rear pick-up points. Front has raised spindles, 935 Camber Plates; lower tubular A-arms mounted in heim joints. Rear has aluminum trailing arms with adjustable 935-style camber boxes and spring plates. Fully adjustable anti-roll bars. Bilstein RSR custom-valved coilovers. 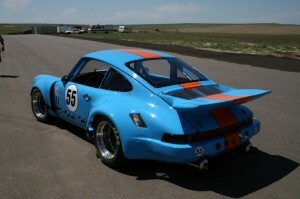 Porsche RSR 3.0L bodywork with removable front and rear “clips”and IROC 55” wide tail.